Did you know that an infographic is 30 times more likely to be read than a text article? And publishers that use infographics grow 12% faster on average than those that don’t. Get results by creating your own infographics. It can be easy and inexpensive with this step-by-step guide designed to allow anyone to generate a professional final product and successfully promote it. Learn proven techniques to identify the right topic for your audience and exactly how to tell your story visually. We have included a rich set of websites to locate usable data and statistics for your infographics. Learn exactly how to find the right designer for the right price. Get access to our recommended designers and reviews. Market your infographic – before it’s even finished! We show you exactly how to use social media to create anticipation and participation from your audience. Submit to the best infographic directories! We have compiled a list of 101 of the best places to list your infographic. Get access to our reviews and guides on popular products like Piktochart and how to use Facebook Sponsored Storied to market your infograhpics. 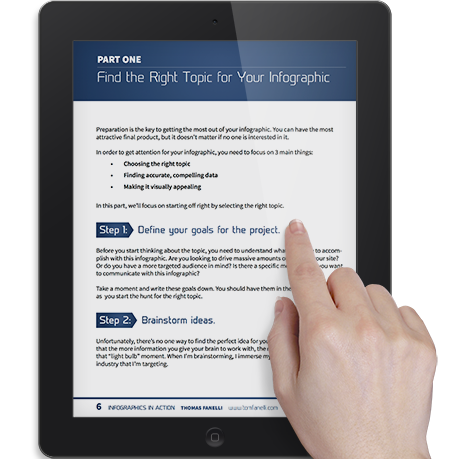 In part 1, you’ll learn how to identify the best topic for your goals, including: The best sources to consult when brainstorming ideas; What to look for when considering different topics; How to ensure that people will be interested in your infographic. A topic is only as good as the data that supports it. In part 2, we’ll cover how you can find the facts and figures you need to create your infographic, including: Finding compelling, accurate data to include; Utilizing dozens of sources to consult for information. In part 3, you’ll learn the steps required to create a visually appealing infographic on a low budget, including: Locating the right designer for your project; Producing a professional and compelling final product; Marketing your infographic – before it’s even finished. In this final part, I’ll share the techniques I used to bring in large amounts of engaged traffic with next-to-no marketing budget, including how to: Get the greatest ROI from your investment; Promote effectively through Facebook ads; Submit to the best infographic directories and more. 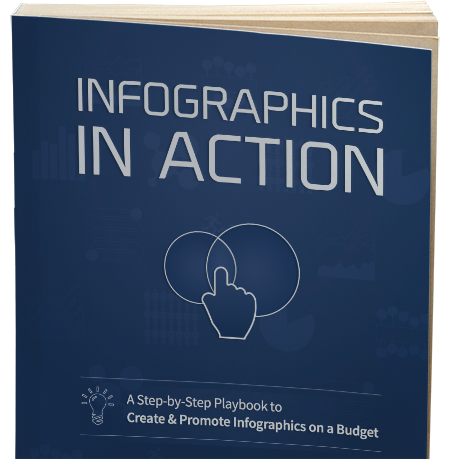 An easy to read, step by step process to creating & marketing with infographics. A First of its Kind!